Iron and Fire... and Sweat! In celebration of the last day of summer, the SFBC crew thought we'd take a fond look back at one of the sweatiest moments of the season. So, without further ado, please enjoy the spectacle of our editor's mind melting before your very eyes! The awesome folks over at The Science Fiction Book Club had some fun chatting up Taylor Anderson's fourth Destroyermen cover I recently finished for them. All on the hottest day of all time anywhere! Such a great series to be a part of. Thanks guys! You can check out the final cover art right here. Did he just say my cover was hot as balls? 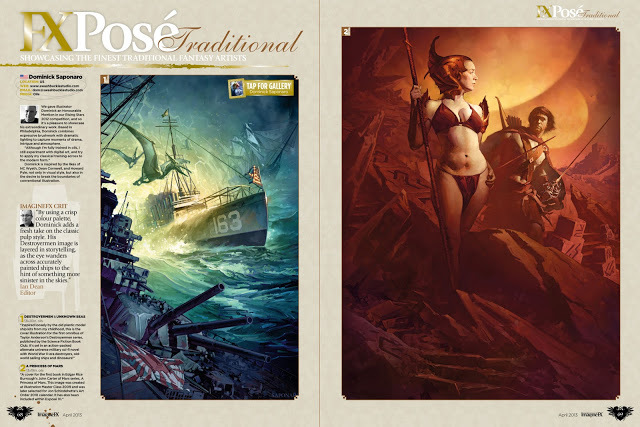 Every month Imagine FX features an artist in the FXPose section of their magazine. They have both a traditional & digital showcase. Back in their April issue I was fortunate enough to be featured in... traditional! "Traditional you say. That's an outrage! Who do you think you're fooling?!" Hmmm... so what happened here? I'm not sure if someone actually thought my work was executed traditionally or if their criteria for the showcase is a little more open. It's hard to tell but I think it was probably the later. Maybe they just look for work that has a traditional feel to it without actually worrying too much about what medium was used. Either way it was a welcome surprise and I was honored. If your not familiar with Imagine FX head on out and grab yourself a copy. Every month features some of the best workshops and interviews with artists from the science fiction, fantasy, gaming, and comic disciplines. It really is a great resource for beginner and seasoned artists alike. Also of note, the iPad version of the magazine is outstanding. While being identical to the print version in every way, it also has just enough interactivity with galleries, videos, and slideshows without trying to reinvent the whole magazine format for a tablet experience. Download the app here and subscribe today. You can also get past issues such as the April 2013 issue from above. So... who out there thought I worked traditionally? Comment below. My companion, friend, brother, son, & studio mate of thirteen years has now passed on. Thank you for all the wonderful moments of inspiration and laughs. May you rest in piece little buddy. To read a little bit more about Roscoe head on over to Christy's blog for a loving tribute. A few sketches from some recently completed commissions. 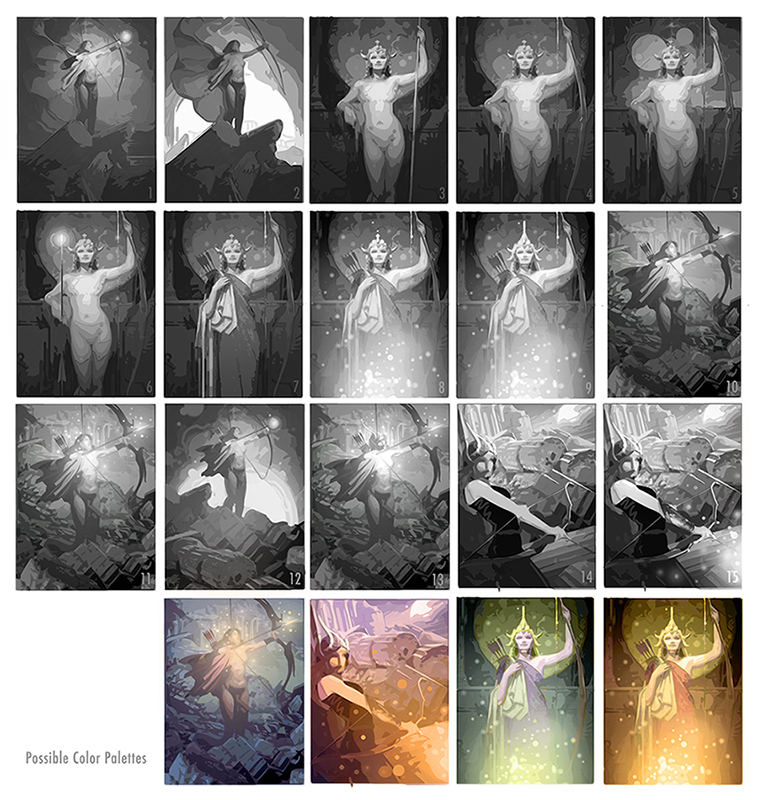 Be sure to check out the final painting for The Eidolon here. A nice little mention from ImagineFX this month! If you haven't already gotten your copy, head on out and check out page 55. I was fortunate enough to be chosen as one of the honorable mentions for their 2012 Rising Stars competition in the Illustration category. Such a great way to cap off an already awesome year.